You can categorize goods based on multiple categorization. This helps in filtering and listing based on applied tags. 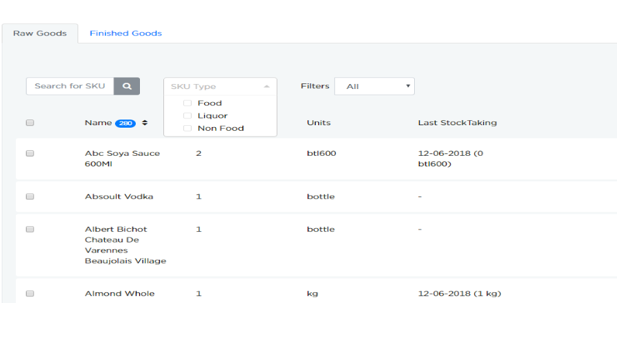 Using the dropdown separate stocktaking for Food and Liquor can be taken. Example 2: In this example, all the recipes are categorized under "Menu type" category. NOTE: Make sure that all SKUs and recipes are tagged under a category, so that it will not be missed out in the list. Filters dropdown is used to filter out items. 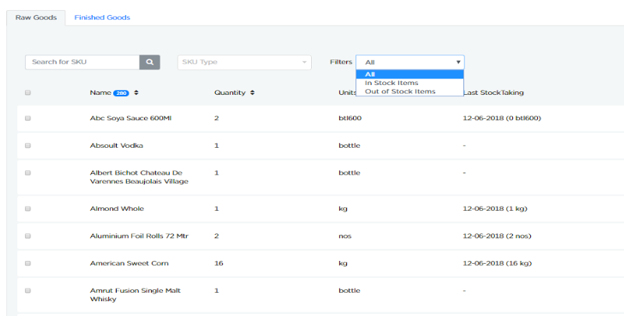 Using this dropdown user can view "in stock" and "out stock" items separately and accordingly, the stocktaking can be taken.